Omar Sosa by Tom Ehrlich and Seckou Keita by Andy Morgan. Presented by the Triple Door and KNKX. “Transparent Water is where world music meets world jazz, where tradition meets improvisation and where the lines of spiritual and earthy meet. The result is stunningly evocative.” (World Music Central). Two celebrated and acclaimed musical adventurers with a rich global heritage that spans jazz, Latin and African influences; the combination of both artists on stage together is an incredibly exciting prospect. 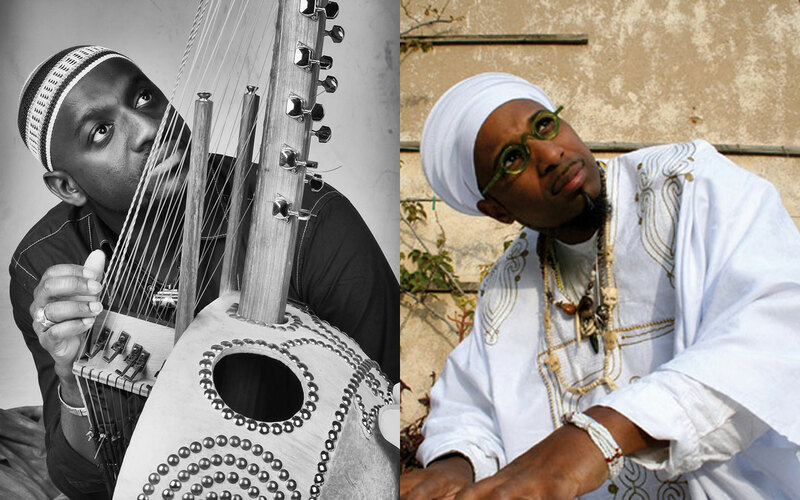 As part of a huge international tour, Cuban jazz pianist and composer Omar Sosa and Senegalese kora player and singer Seckou Keita perform music from their first collaborative album together, Transparent Water (out now on WorldVillage). The record is a captivating dialogue full of serenity and a sense of gentle elation, and brings together influences from across five continents. Having grown from a chance musical encounter, it’s an album born largely out of improvisation – unlocking a profoundly spiritual brand of music. It is the latest example of Sosa’s determination to seek new combinations, a manifestation of improvisatory freedom and the joy of shared artistic expression with Keita, who recently won the Songlines Best Album Award 2016 for his last solo album 22 Strings alongside a nomination for Best Artist.